Pondicherry (also called as Puducherry) is one of the most popular tourist destinations in South India. 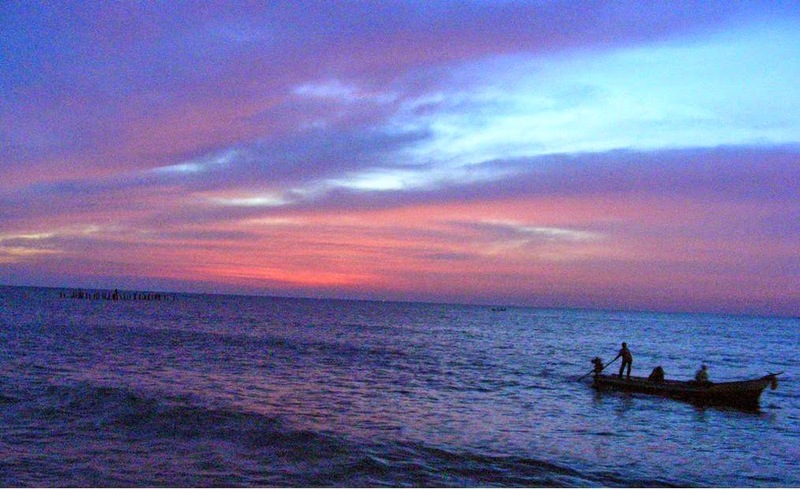 I had been longing to visit Pondicherry again for quite a long time (No.. No.. that’s not the reason, I am non-alcoholic:) ) ; I had already been there in early 2005, but was a bachelor then- came with friends. Now the experience of staying with family is totally different and awesome. Loved this long week-end, Gandhi Jayanthi followed by Pooja holidays enabled us to plan a good three day trip to the East Coast - Pondicherry & Cuddalore. Did not get much time for planning and preparation, but was lucky enough to get the train/bus tickets and hotel bookings, in a short duration. We started from Bangalore on the night of 30th Sep. I never imagined that there’s a train from Bangalore to Pondicherry, that too with perfect timing. It was Dadar-Pondicherry Express, left Bangalore at 11PM and reaches Pondicherry on the next day morning at 7.40AM, on-time. Here you go, below was our travel itinerary – 2 days full days at Pondicherry and the last day at/around Cuddalore in Tamilnadu. Botanical Garden: The "Life of Pi" Park is "Lifeless"
Reason#2: The super-hot weather - It was just 7.40AM in the morning, but the sun was already blasting at 36+ degrees. It’s been long time since we traveled outside Bangalore (where the avg. temp is just ~25 deg.C). It was very difficult to get accommodate, we literally needed some shadow to rest on . The Botanical Garden is just a few hundred meters from the railway station. So we started our Pondy trip from the Botanical Garden. This is the same gorgeous garden where the Oscar winning movie "Life of Pi" is made, but unfortunately all those beauty was alive only on the screen. In reality, it needs a lot of maintenance and proper management. No security, No controller, …nobody was there to regularize. The Forest Department of Pondicherry should really focus to improve this place. Anyway, our intention of the visit was simple, we just needed some shade from the sun. 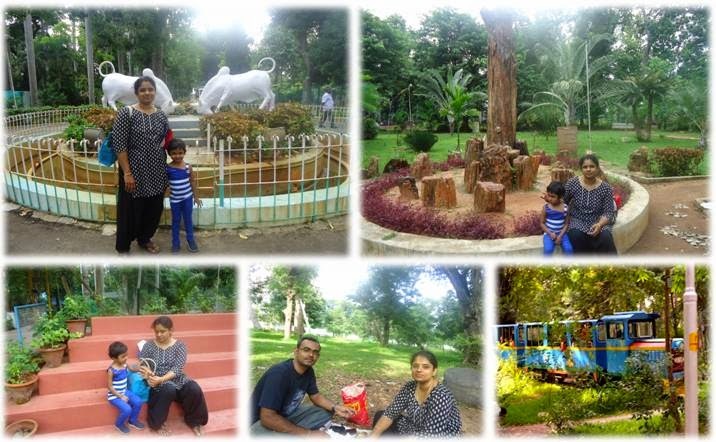 We had our breakfast at the park (food that we had brought; there's no restaurant/canteen inside the park), we walked around the park, clicked a few snaps and moved away to the Promenade ….. I am not a qualified historian, but do have a passion for the history and never miss to read through the history of the new places whereever I go. Below history is the excerpts of my reading from various sources. 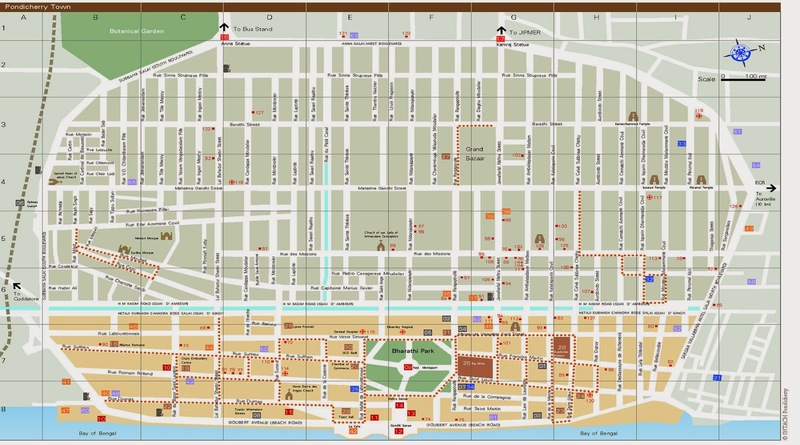 I feel, Pondicherry doesn’t have a long history to track-on. We have records only after the Colonial Age – arrival like the Dutch, Portuguese, English and the French. Though early archeological findings at Arikemedu, have confirmed an ancient Roman settlement at Pondy, the actual history begins with the French only. Old Tamil literatures say that, Pondy was one of the leading commercial ports during the Vijayanagar, Pallava, Chola, and Pandya periods. Then Portugese set up a factory but forced to leave by the Gingee Sultan, who was ruling Pondy region at that time. Soon after the Dutch invaded into India and set up their base in Porto Novo, Cuddalore. Gingee Sulatan was not able to fight against the Dutch and he invited the French to take over the Pondicherry region in AD1673. This was the key turning point in the History of Pondicherry. From then, The French and Dutch fought many wars over Pondy region and in 1699 the French regained Pondicherry with an amicable deal with the Dutch. As soon as the wars came to end (in 18th century), the town saw a significant growth in economy and Infrastructure, which stays stronger even today. 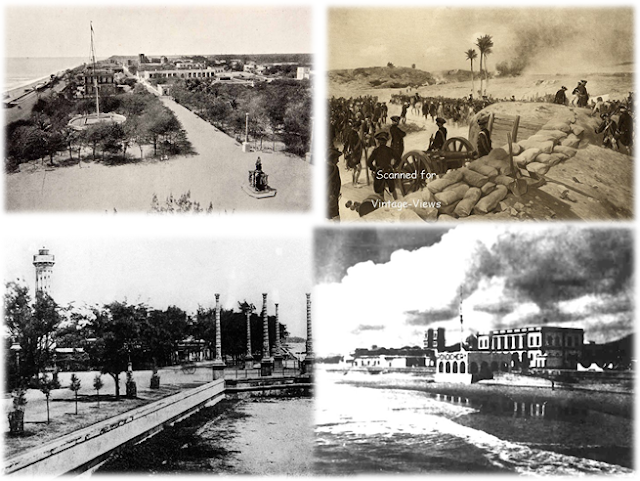 Many Governors, especially Dupleix laid the foundations for today’s Pondicherry and converted the town into an vital town. But Pondy’s good luck did not run long, since after the arrival of English man - Robert Clive. Cliver distorted the existing French-Dutch deal and recaptured Pondy area and along with several key territories like Madras, Arcot, etc. from the French. Again, in 1765 Pondy was returned back to the French, but it was not permanent. The Britsh and French had several wars, and it was only in 1816, The French could gain stable control over Pondicherry. Even after India’s independence, Pondy was in the control of France and they handed over Pondy to India with certain requests and demands in 1954.From then,the Pondicherry continues as the Union Teritory of India. The impact of the French is still stays in the town. To a new visitor the French influence is quite obvious. The French names for the streets, the French architectured buildings, French foods, the bicycles on the streets, and very importantly still a lot of French people in the town makes Pondy – truly a “Mini-France” within India !!! 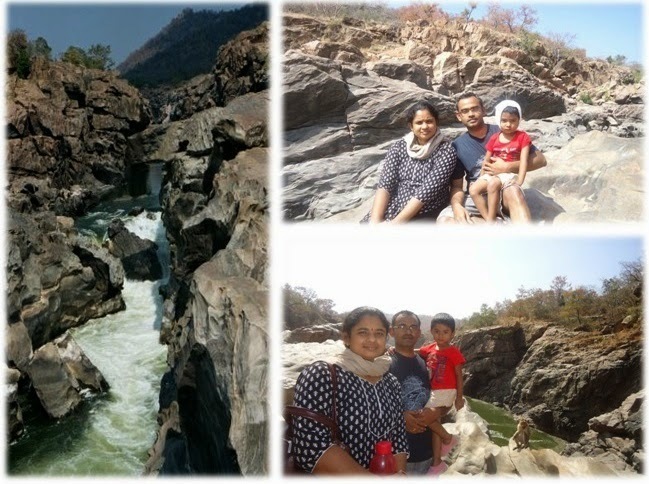 After so much of fun at Sangama, we headed to Shivasamudram in the 2nd half of the day. 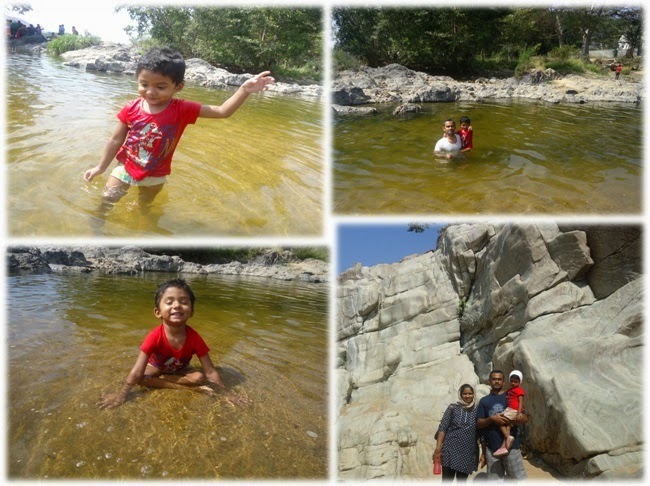 This is our 2nd trip to shivasamudra, was at an off-season- but still had decent water flow. Within another hour or so we found ourselves at mesmerizing Gangan Chuki falls !!!. It was around 3PM, the sunny afternoon light was augmenting the scenic beauty of the falls!! We spent some time enjoying the sceneries of the Gangan Chukki falls and left for the Barachukki, which is just 10minutes away from there. Without wasting a minute, we rushed down to the bottom, and the Coracle ride took us almost to the feet of the falls! Watching the gushing waters from right at the bottom of it, was so spectacular !!!. After the coracle ride, We decided to get drenched , all of us got into the cold waters, including the kids. And did I miss something???? Yeah, Adventure!. We tested our swimming skills at the wild waters :P .It was incited by the most daring person in our group (yeah, no need to guess… it was NOT me :) and soon a few of us joined. Can’t stay long… the rocks were very slippery and the cold water made us completely numb within 15-20 minutes. We dressed up, spent some more time enjoying in clicking the cameras, and climbed up back to our car at around 6PM. As soon as we start, the rain also started. It blasted heavily till we break for a hot coffee at Kanakpura. With the company of some nice music for rest of the travel, we reached home at sharp 9PM. We’re so tired, did not even feel like having dinner. For the sake of health, we had a few chapathis and wrapped ourselves into the bed in minutes. We really cherished the whole day. This became yet another memorable trip. We did not go out of Bangalore for quite a long time, was desperately looking for a getaway out of all our routines! . As recommended by a friend, we decided to pack our bags for a single day trip to “Mekedattu”. We’re nine people, hired a Chevrolet , was good enough for the short trip. Mekedattu is not so long, just 100KMs one way from Bangalore. We planned to start at 7AM, the vehicle arrived on-time, but we’re late as usual :). Not bad, we could make it at around 8.15AM at least. Good that we had a couple in our group who had been there already – to guide us (in fact they’d to guide the driver too, he was also not sure about the route). One of our friends had brought nice idly’s with chicken curry. Had a good group breakfast at the outskirts of Kankapura town. In about another 20minutes, we had to take a left from the main road, reached the Sangama in the next 40 minutes. 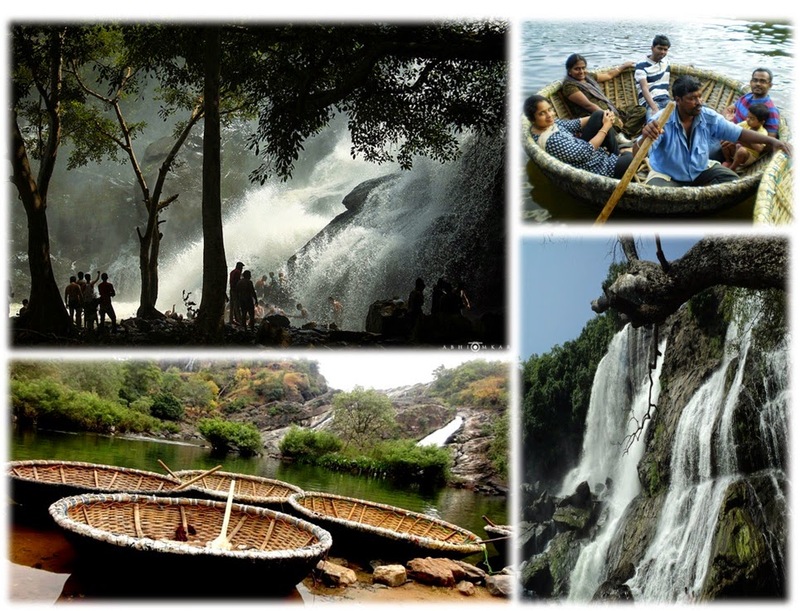 Sangama is the place where River Akravathy convergences with Cauvery river. Our vehicles can go up to this point only. We parked our car and got into the chill water. Mekedattu is another 5 KMs from the banks of the Sangama. We took the super shuttle service – an old bus which takes passengers to-fro Mekedattu. That’s the only option available to reach Mekedattu, or else you can walk! . 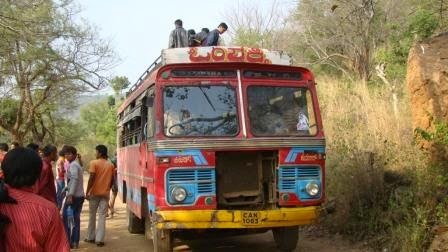 But believe me, the bus itself was an tourist attraction, still alive from the stone age :P . The fare was INR.50 per person for a 2 way trip. Sangama is the place where we all cherished a lot, kids especially. There was not much water; it was not deep even for my 3 year old daughter. We had brought Mushroom Biryani with apt junky side dishes for the lunch (what a wonder, my wife’s cooking came out very well for the first time :P). We enjoyed the food still while we’re bathing. Dragging our kids (they’re not ready to come out of the water even 2 hours of fun), we headed for the chuki falls, which another 1 hour from the Sangama. Will write the Chuki falls experience in a separate post. At around 7PM, we started our return journey from Chuki falls. We’re in Koramangala at about 9.15PM ; friends got us some hot madurai parathas for the dinner – what nice way to sign-off a happy trip :), we thoroughly enjoyed it!.